We decided to take a road trip to visit my mama, with some side trips to some national parks, so we hopped in the car and high-tailed it out of Hollywoodland to where the wind comes sweepin’ down the plains, Oklahoma. 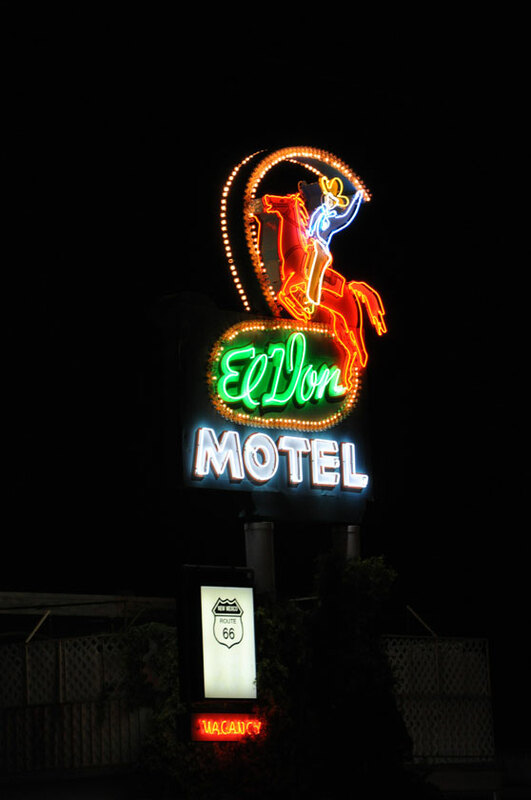 While we spent most of the time speeding down I-40 (I don’t really mean speeding – we stuck to the speed limit the whole way, officer) we took lots of pit stops to gas up, stretch out legs and check out bits of Route 66. We didn’t stop in Winona, but we did in Oklahoma City, Amarillo, Gallup, Flagstaff, Kingman and Barstow (reverse order heading out there, of course). We planned on driving half way to Oklahoma our first day, so we pulled in to Albuquerque, New Mexico around 10pm. Man, that town shuts down after dark, at least in the Old Town section where we were staying. 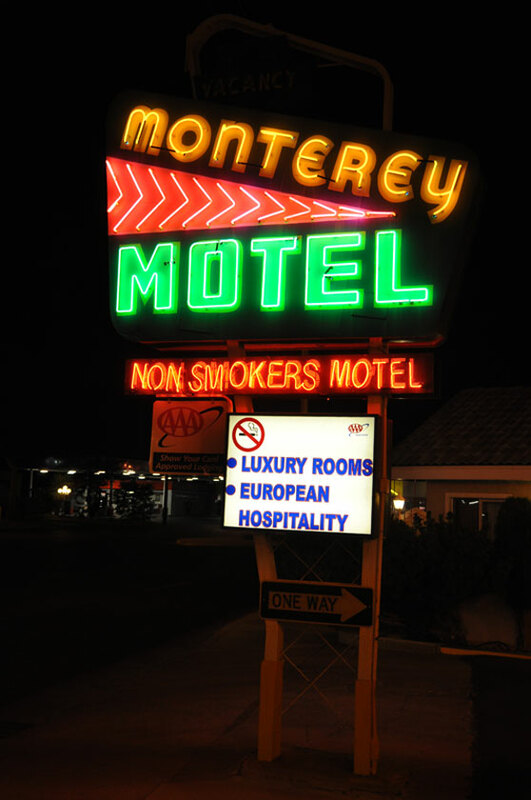 I wanted to stay in a classic Route 66 neon-signed hotel, so we stayed in the Monterey Non-Smokers Motel (the real name, I kid you not.) The staff were really helpful in recommending some restaurants and things to do nearby. If only we were staying longer. 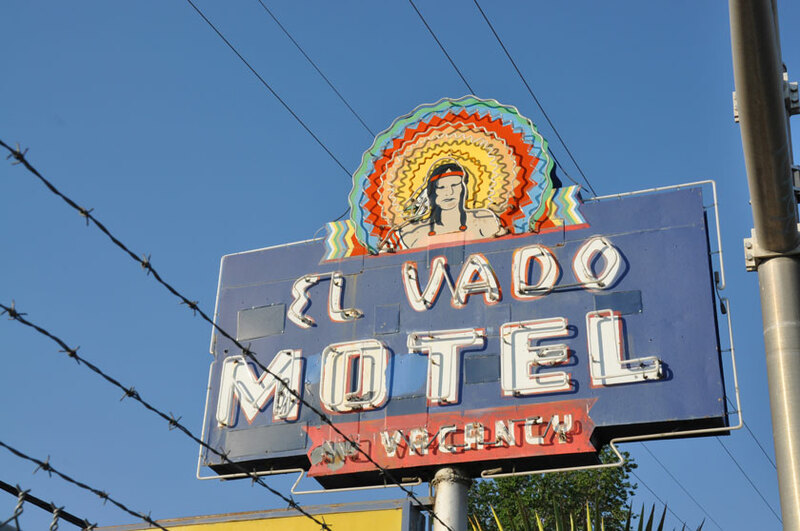 We loved the few pieces of classic hotel neon we got to see before we collapsed. 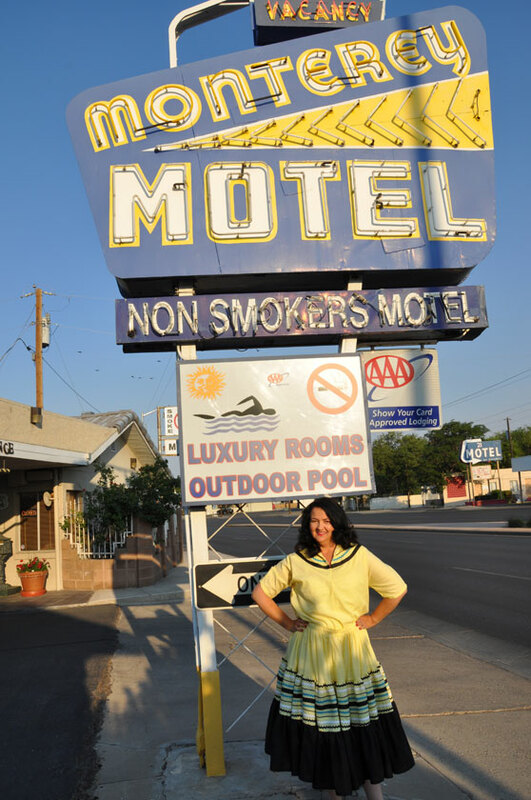 Unfortunately, in the morning we found that not all classic Route 66 hotels have faired so well. 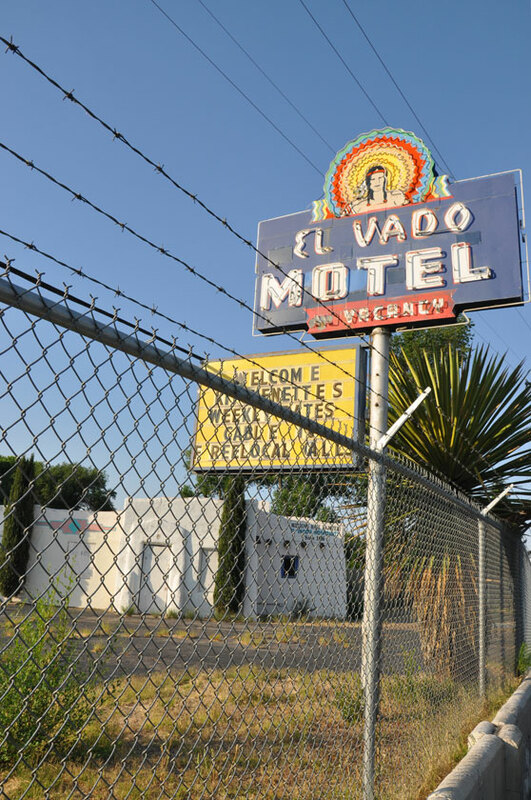 Many were shuttered and one, the El Vado, was a shadow of what you could tell it once was. At least it hasn’t been torn down yet, but you can just imagine what it would have looked like in its heyday. 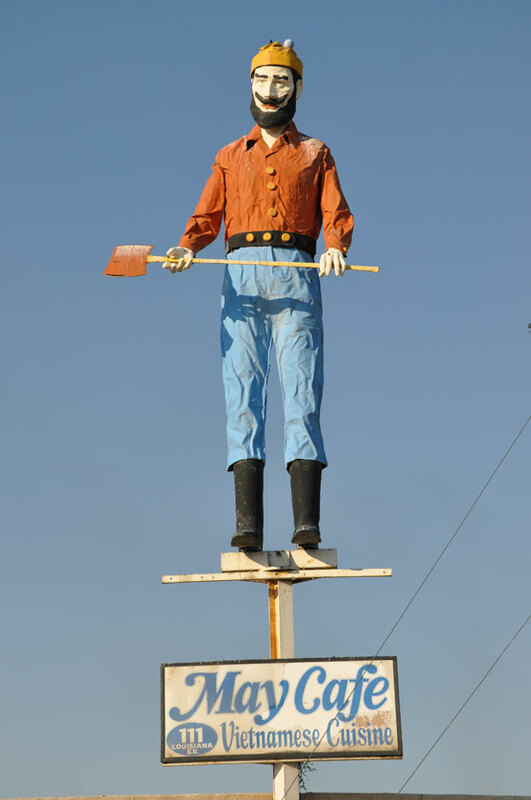 And, of course, Route 66 wouldn’t be what it is today without fiberglass characters, with my favorite being tall fiberglass men. This one is a top what is now a Vietnamese restaurant. A bit of a strange contrast. We woke up at crack-o’-dawn thirty and headed out of town before anything opened, so we didn’t get to enjoy any of the restaurants that were recommended to us for a fabulous Southwestern breakfast. And that was the first leg of our trip. We made it safe to the Sooner State. Patio dress by moi, based on McCall’s 8873, published in 1952, including about 42 yards of rick rack and ribbon in the skirt alone. Great photos! On our recent trip we only spent one day in Albuquerque and I think I could have spent a little more time there. Did you notice that every where you went there were signs saying not to leave anything of value in your car. Apparently, car burglary that is a big problem there. We were glad to have made it out with our small change! Maybe that is why there was a gaggle of police officers gathered around the old town square the morning we left. I didn't see there was a donut convention in town, so maybe they were doing recon.